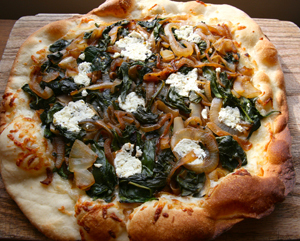 Look for topping ingredients at your local growers’ market like spinach, onions, tomatoes, or goat cheese for a super fresh pizza. In a small bowl, dissolve the sugar or honey (which “feeds” the yeast) in warm tap water that registers 110º to 115º F. For temperature accuracy, insert an instant-read thermometer in the water. Water that is too hot will kill the yeast, while water that is too cold will not activate it. Combine 3 cups of the flour with the salt in a large mixing bowl. Make a well in the center of the flour and pour in the yeast mixture and the oil, if using. Using a wooden spoon, vigorously stir the flour into the well, beginning in the center and working toward the sides of the bowl, until the flour is incorporated and the soft dough just begins to hold together. Turn the dough out onto a lightly floured surface. Dust your hands with flour and knead the dough gently in the following manner: Press down on the dough with the heels of your hands and push it away from you, then partially fold it back over itself. Shift it a quarter turn and repeat the procedure. While kneading, very gradually add just enough of the remaining ¼ cup flour until the dough is no longer sticky or tacky; this should take about 5 minutes. As you work, use a metal dough scraper to pry up any bits of dough that stick to the work surface. Continue kneading until the dough is smooth, elastic and shiny, 10 to 15 minutes longer. Knead the dough only until it feels smooth and springy; too much kneading overdevelops the gluten in the flour and results in a tough crust. Shape the dough into a ball and place it in a well-oiled bowl, turning to coat completely on all sides with the oil. (This oiling of the dough prevents a hard surface from forming that would inhibit rising.) Cover the bowl tightly with plastic wrap to prevent moisture loss, and set to rise in a draft-free warm place (75º to 85º F. — a hotter environment may kill the yeast) until doubled in bulk, about 45 minutes for quick-rising yeast or 1 to 1½ hours for regular yeast. With your fist, punch down the dough as soon as it has doubled in bulk to prevent overrising. Shape it into a ball, pressing out all the air bubbles. If you are using bread flour or semolina flour, turn the dough in an oiled bowl to coat once more, cover the bowl tightly with plastic wrap and refrigerate it until puffy, from 35 minutes to 1 hour. Omit this step if using all-purpose flour. If you cannot bake pizza within 2 hours after rising, punch the dough down again, turn it in an oiled bowl to coat once more, cover the bowl tightly with plastic wrap, and refrigerate. (The dough can be punched down a total of 4 times and kept refrigerated up to 36 hours before the yeast is exhausted and the dough unusable.) Let chilled dough come to room temperature before proceeding. To make a 15-16-inch pizza, keep the dough in a single ball. To make two 12-inch round flat pizzas, two 10-inch calzones, two 9-inch deep-dish pizzas, or a double-crusted 10-inch round stuffed flat pizza, divide the dough into 2 equal sized balls. If you wish to freeze dough for later use, wrap the pieces tightly in plastic wrap or seal in airtight plastic containers and freeze for up to 4 months. Before using, thaw in the refrigerator for 1-2 days or for a few hours at room temperature. To create flat pizzas with a rolling pin, place a ball of dough on a lightly floured surface and dust the top of the dough lightly with flour. Using the heels of your hands, press the dough into a circle or other desired shape, then roll it our with a lightly floured rolling pin until it is about ¼ inch thick, keeping the edges a little thicker than the center. While rolling the dough, pick it up and turn it over several times to stretch it. Continue to keep the outer edges thicker than the rest of the pizza and add a little flour to the surface of the dough whenever needed to keep it from sticking, Rest one hand near the edge of the dough round and use the other hand to push the dough to form a slight rim around the dough, working your way completely around the perimeter of the dough. (You can also shape your dough by hand, and achieve a super-thin crust by stretching it.) Fill and bake as quickly as possible. Lay the dough round on a cornmeal-dusted pizza peel (a big wooden paddle), a lightly oiled pizza screen or on wax paper that can go right on top of a hot pizza stone. For the crispiest crust, bake flat pizzas directly on a baking stone. (Follow the directions of your pizza stone.) For best results, preheat the oven with the stone already in the oven, then slide the pizza onto the hot stone. This is when a pizza peel would be helpful, but transferring directly onto the stone with wax paper also works. If you bake on a wire or mesh screen, lightly oil the screen first. You can either put the screen on top of a pizza stone or directly on the oven rack. Note on temperatures: Several recipes call for 450º or 500º F, but my pizza stone said its maximum temperature was 445º. I baked my pizzas at 440º and they baked quickly. Bake pizza until the crust is golden or as directed in individual recipes, usually about 10 minutes on a stone, or about 15 minutes on an oven rack. Follow instructions for Basic Pizza Dough, except: Combine the flour and cornmeal. Use that blend when the instructions call for flour. Follow instructions for Basic Pizza Dough, except omit the sugar. Sprinkle the yeast over the water and stir gently until it dissolves, about 1 minute. When yeast is mixed with the water at the proper temperature, a smooth, beige–colored mixture results. If the yeasts clumps together and the water stays clear, discard the mixture and start over. Let stand in a warm spot until a thick layer of foam covers the surface, about 5 minutes, indicating that the yeast is effective. Discard mixture and start over with a fresh package of yeast if bubbles have not formed within 5 minutes. Follow instructions for Basic Pizza Dough, except: Combine the 2 flours in a bowl. Where the directions require flour, use the blend.